Assistant Director Ryan Johnson said in the O’Fallon Weekly column that he came across this quote attributed to the prominent scholar and library-world advocate, R. David Lankes: “Bad libraries build collections; good libraries build services; great libraries build communities.” Ryan said he likes to think we fall into the great category. Ryan said we do spend time and effort building our collections and services as those things are easy to track and market. We can determine how many books were checked out over a period of time or how many people attended an event. But it’s harder to measure community and harder still to measure the impact we have on our community. One story of community reaches back over twenty years. “Recently we learned of the passing of Maurice Fohne. I didn’t know Maurice, but he and his late wife, Carol, were so beloved by their neighbors that in 1995 a bench was dedicated to the couple commemorating their 50th wedding anniversary,” Ryan said. Patrons can find that bench in a nice spot on the west side of our building. 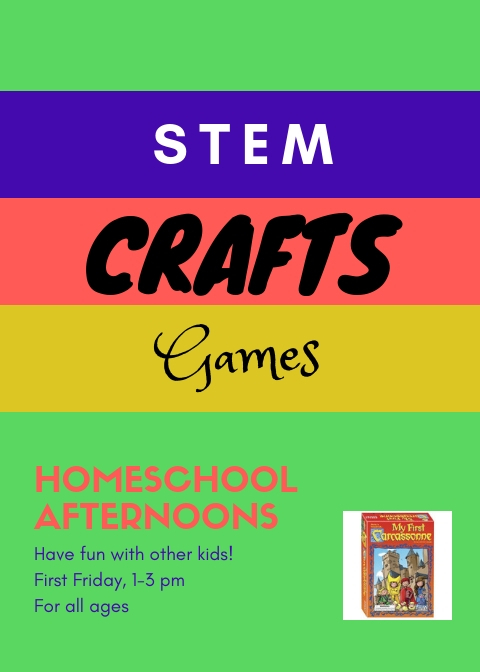 Homeschool Afternoons Join us on the first Friday of each month from 1 – 3 pm for board games, crafts, and STEM activities. We will have all the supplies and materials you need or bring a game or craft to share. This is for all ages and is a great way for children and parents to build their community. Sign up here for a monthly reminder. ECO Club: The Saturday, Oct. 6 meeting at 1 pm will focus on backyard birds. Learn about common species and how to identify them. We will also paint recycled bottle bird feeders for you to take home. All supplies will be provided. Sign up here. ECO Club is an all-ages, family-friendly club focusing on green living and helping our community get in touch with nature by encouraging both individuals and groups to get outside, take action, and improve the environment around them. We will learn how to reduce our environmental footprint, care for natural spaces and wildlife, and become an ally for Earth. We host both a Chess Club for Teens and a Chess Club for Adults this Sunday, Oct. 7. The teens will meet from 1-3 pm and the adult session will be from 3-5 pm. Click the link to sign up for the Chess Club for Teens or the Chess Club for Adults. Scholastic Chess is an extremely important game that tweaks the cognitive functionalities, enhances academic skills, aids rapid thought processes, boosts logical and strategic thinking, and helps to gain exceptional memory skills, creativity, focus and discipline. Join us as Dr. O. T. Olabanji teaches patrons chess and why it is so important. Crochet Club – Join us every Sunday as we gather to work on projects, go over different techniques, or work on independent projects. Gain or build new skills. All ages welcome. Crochet Club meets every Sunday from 1:15 p.m. to 2:15 pm excluding during holiday and weather closures. This event is open and free to all. Registration is encouraged. Really support your community and join us Monday, October 8, 2018 – 3:00 PM and the Mississippi Valley Regional Blood Center for a community Blood Drive. The Blood Center works together with volunteer donors to provide a lifesaving resource to patients in need. Blood donation is a safe, simple procedure that takes about 45 minutes to one hour. An identification card or Donor ID is required to donate. Potential donors must be in good health, weigh at least 110 pounds, and be at least 17 years old. Potential donors may be 16 years old and donate, but must present a signed parental consent form for 16-year old donors (or click here for parental consent form in Spanish). For more detailed information on donor eligibility, please click here. For a complete list of activities and events go to our calendar. Be sure to check out “Library News & Notes” in the next edition of the O’Fallon Weekly.